Today was the day. 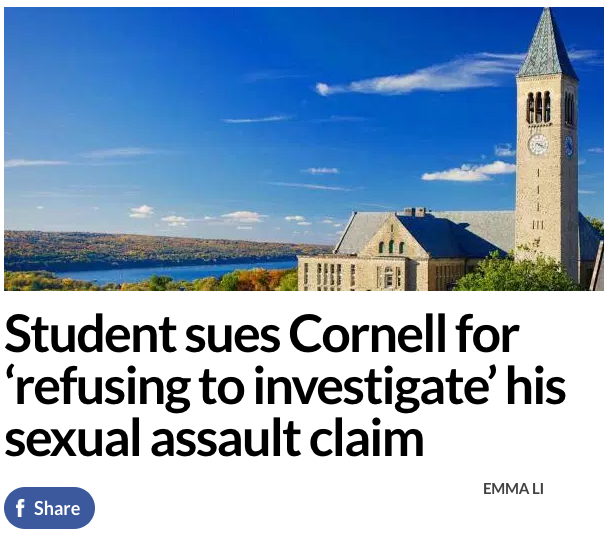 November 30, Judge Eugene Faughnan heard from both John Doe’s attorney, Alan Sash, and Cornell University’s attorney regarding the gender discrimination claim against the Cornell Title IX Investigator. When I walked into the courtroom to observe the hearing, John Doe’s father and his attorney sat at the righthand table chatting with the judge about his son’s sports team. Cornell’s attorney sat looking over her notes. Right off the bat, Doe’s dad and attorney seemed much more at ease than the defense. Doe’s attorney, Alan Sash, argued that Cornell neglected to adhere to their own policy. He claimed that in waiting to pursue the discrimination charges until after the decision to exonerate John Doe was essentially analogous to an individual on trial getting their right to a jury, only after the verdict. Each side had an opportunity to address this claim in front of the judge today. The Cornell attorney took up the argument that there was no harm if John Doe were to be exonerated and questioned what would stop him from circumventing the policy in place and tie up the case in court. Frequently in her presentation, the judge interrupted her with the common theme in his question of, if there’s nothing to hide, and there is no discrimination why not prove him wrong and/or why not change the policy? Each time, the defense attorney seemed caught off-guard and flustered by the reaction. When it switched over to the prosecution, and the judge asked about the legitimacy of the practical argument about circumventing the policy, Sash argued harm is harm and asked if practically speaking, why would Cornell not want to know if their investigator was discriminatory? On our way out of the courtroom, Sash was kind enough to share some thoughts on the proceedings. Now, after today, Judge Faughnan will deliberate and get back to the attorneys with his decision.